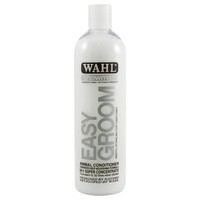 Wahl Easy Groom Conditioner is a deep nourishing formula that has been carefully balanced to protect and moisturise hair after shampooing. Made with natural ingredients that include exceptional conditioning compounds, Wahl Easy Groom Conditioner rinses out effortless and will revitalise the coat, leaving it smooth, soft and shiny with no sticky or waxy residue. Wahl Easy Groom Conditioner ensures a silky, manageable finish and will deliver ultimate conditioning results after every use.